Product Piracy will cost worldwide business over 400 Billion Pounds this year – that’s an estimated 10% of worldwide turnover. Shoes, Clothing, Medicines and Electrical Equipment are some of the worst markets to suffer, with original manufacturers not only losing sales, they also incur the costs related to complaints, return of goods and the legal costs of protecting their products. What is almost impossible to measure is additional damage to the company’s reputation caused by poor quality copies. Fake and ‘replica’ goods have now become commonplace, with copies so sophisticated they are hardly distinguishable from the original. This is also true for the packaging, including many mainstream security measures, like holograms, chemical markers and simple security labels. Another very profitable market for counterfeiters is the huge and ever-expanding market of health foods and dietary supplements. This sector is currently worth around £5 billion per year in Europe alone. In addition to these lifestyle products, more and more pharmaceuticals such as antibiotics, analgesics, contraceptives, antidepressants and even anti-cancer drugs are now faked. Studies estimate that worldwide about ten percent of prescribed drugs are in fact counterfeit. In developed countries, that figure is still about 1%. With the UK Pharmaceutical industry worth over £8 billion per year – that is still a revenue loss of £80 million for medicines alone, which makes the size of the problem very clear. With the growth in popularity of online ordering for medicines and medical products, customers run a much greater risk of receiving possibly harmful counterfeit products, rather than the genuine goods. The significant danger for the Pharmaceutical industry is that as the production and delivery systems for medicines become increasingly pan-European and even global, this makes it much easier for counterfeiters to infiltrate their sophisticated counterfeits into the legitimate distribution channels. 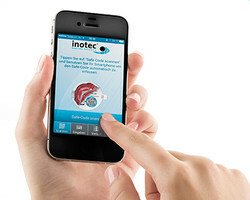 “One solution, is for companies to provide their customers with ‘Track & Trace’ solutions, where both distributors and end-users can check the originality of the product beyond any doubt,” explains David Stocker, Sales Director for inotec. “For this reason, we are launching our DIOSAFE label – a two layer product protection seal, which can be completely customised in shape, colour and material to suit the needs of the customer. The DIOSAFE labels are supplied on continuous rolls so that the system can be smoothly integrated into existing packing processes. “The manufacturers mark each product with a DIOSAFE label which carries the unique codes, these codes are then activated in the DIOSAFE secure database,” explains Mr Stocker. Distributors can verify the authenticity of the product at any time in the process using the surface QR codes. The individual code for the end user is only visible when this outer label is removed and in breaking the seal the surface code is visibly destroyed. This end user code can be scanned in the form of a QR code using a smartphone or entered as a 20-digit number on the DIOSAFE website. The customer then has immediate contact with the DIOSAFE database and can be told instantly if the product is genuine. Once scanned the original code is automatically deleted in the system and cannot be copied or reused. One significant additional advantage of this system is that once the code has been scanned, the manufacturing company has direct contact with their customers. This enables the manufacturer to inform the customer about promotions, offer Step-by-step instructions, Coupon Codes, complementary product offers or even sale invitations.